It always began precisely at midnight. The students knew it was coming and strained to hear. Just a few tones at first. Faltering, random, described by one as “the shriek of a lost soul.” Gradually, the sounds found structure, became recognizable notes, but were always composed of sad, despondent phrases. It was “the most mournful music that ever fell upon the ears of man,” stated a listener. 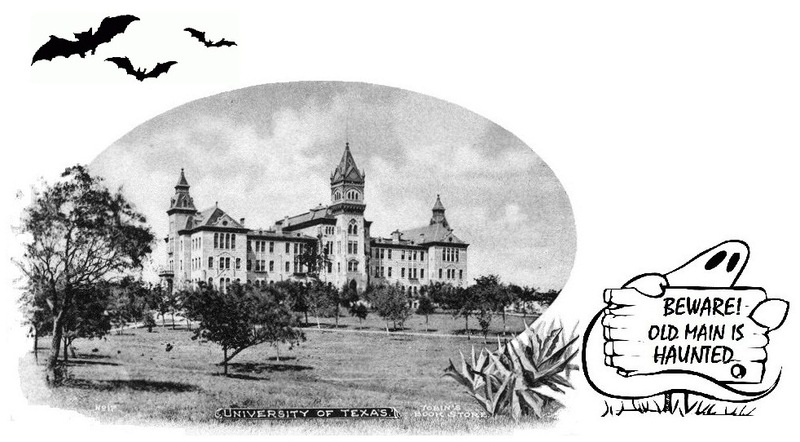 In April 1903, the talk of the campus was about the mysterious “ghost” in the old Main Building. Two or three times a week, just as the clock struck twelve, someone – or some thing – began to play the piano kept on the stage of the auditorium. Above: The Old Main auditorium as seen from the stage. The Victorian-Gothic styled old Main Building – Old Main – was the first structure on the campus, with a central tower, east and west wings, and a north wing that housed a basement gymnasium, the University library on the first floor, and a large auditorium above. The main floor seated 1,000, with room for an additional 700 persons in a balcony that wrapped around three sides of the room. Rows of tall, Gothic-arched windows along each side allowed for ample sunlight during the day, and the auditorium was outfitted for gas lighting at night. 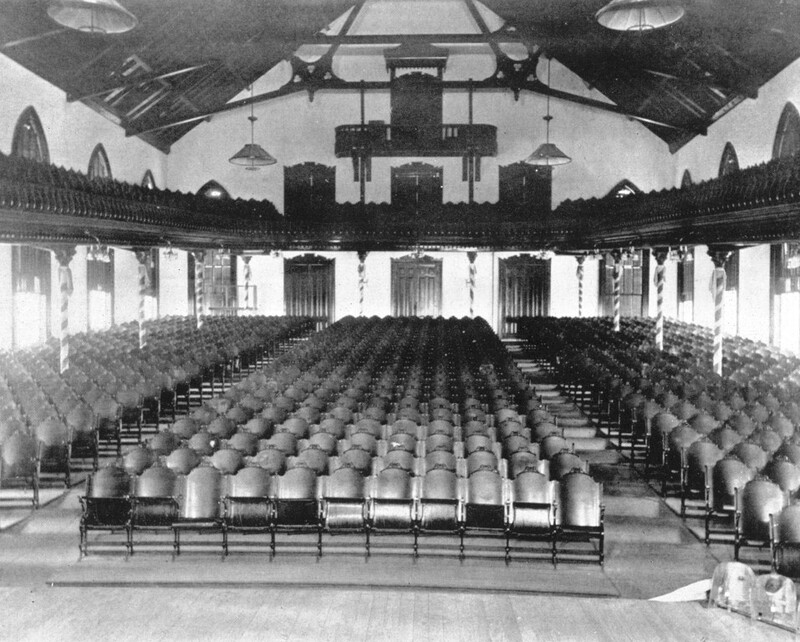 The stage at the north end was used for concerts, plays by the Curtain Club, convocations, literary society debates, and spring commencement. Raucous football rallies were also held here, though only the men were permitted to sit on the main floor. At the time, it was considered unbecoming for women to participate in such loud and spirited events. Co-eds were expected to quietly watch from the balcony. Above: The auditorium view from the back row. 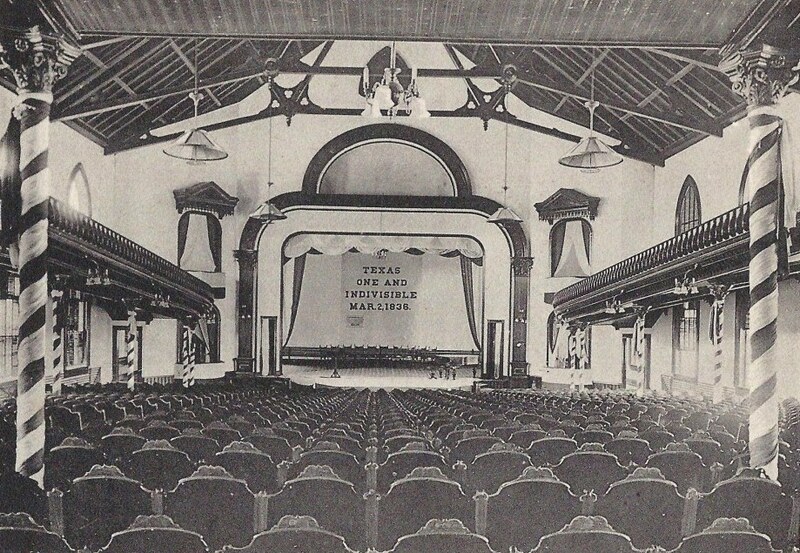 The columns and stage are decorated for a Texas Independence Day convocation. Click on the image for a larger view, and you’ll find the piano on the right side of the stage. The late night piano concerts were first heard in March, when the music escaped through an open window and drifted across the campus. A few melodies were familiar, but most was improvisation, and performances lasted about an hour. The issue, though, was that the auditorium remained utterly dark, and attempts to discover the identity of the late night pianist had failed. Doors to the auditorium were always kept locked after hours. At the slightest sound of entry, the music ceased, and the room was found to be empty. 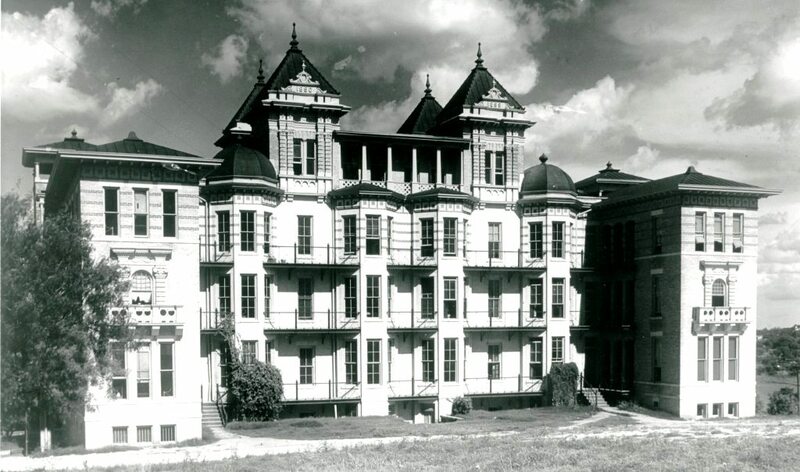 By April, the “ghost” in Old Main was the talk of the Forty Acres, and catching the phantom in the act proved to be an irresistible challenge to the residents of B. Hall (photo at left), the men’s dorm just down the hill to the east of Old Main. On a weeknight near the end of the month, almost fifty B. Hall men organized an ambush. Sentries were posted at all of the Main Building entrances to prevent escape, and a few kept an eye on the auditorium windows. They waited quietly until midnight, when, right on time, melancholy tones once again began to emanate from the building. Having borrowed a key from the night watchman, a dozen students rushed in to the auditorium, struck matches, and lit the gas lamps. The music stopped immediately. The hall was thoroughly searched and all of the potential hiding places checked, but to no avail. None of the sentries reported seeing anyone. Perhaps the piano player truly was a ghost! Baffled, the students quietly appointed a committee of the bravest three to remain in the auditorium while the others returned to B. Hall. The lights were doused, the group made noises of giving up and going to bed, and the auditorium was evacuated, except for the three, who quietly found seats in the back row. They waited for almost an hour and were about ready to retreat, when, out of the inky darkness, the piano began to play. “The music began so low at first as to almost not be heard,” remembered one of the committee, “and gradually came up just as the wind does through a pine forest.” With their hair standing on end and beads of cold sweat on their foreheads, the three remembered their mission, struck matches, and rushed the stage. The piano fell silent. Another search. But no one was there. With the time approaching 2 .a.m., the committee, now more than a little spooked, decided to withdraw to the safety of B. Hall. “Is this the ghost?” replied Sinclair, who quickly realized the caller was probably at a phone booth installed in the rotunda of the Main Building. Bounding down the stairs, Sinclair found David Frank, who was also studying. Frank hung up, bounced down the stairs two at a time, and yelled for other B. Hallers to come help. Within a minute, he was in the poorly lit rotunda, where he found Sinclair and an unknown person locked in mortal combat. Together, Frank and Sinclair managed to subdue their captive and drag him out of the east entrance of Old Main. They continued down the hill toward B. Hall, where voices of others could be heard. This caused the “ghost” to panic. He made a final, desperate lunge, broke free, and ran into the night toward the southeastern corner of the Forty Acres. A future editor of The Texan student newspaper, Frank was also on the track team and sprinted in pursuit, despite the danger of a precarious hill. (It survives today as the incline between Garrison Hall and the Graduate School of Business building.) Frank overtook his target, tackled him below the knees, and held on until others arrived. Surrounded, the “ghost” was summarily carried up to the fourth floor assembly room of B. Hall where a kangaroo court was organized and a trial commenced immediately. Above: The original Brackenridge Hall – or “B. Hall” – just down the hill east of Old Main. The assembly room was on the top floor. 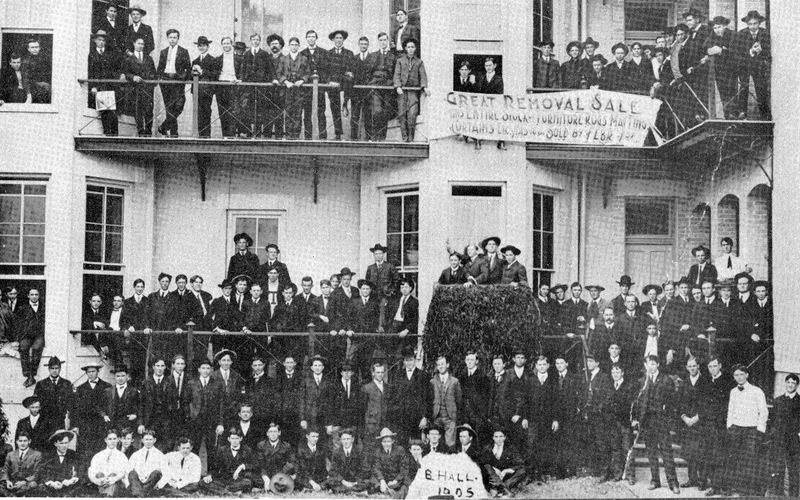 Who was the “ghost” of Old Main? No one seems to remember, other than his first name was Earnest and was a fellow resident of B. Hall. 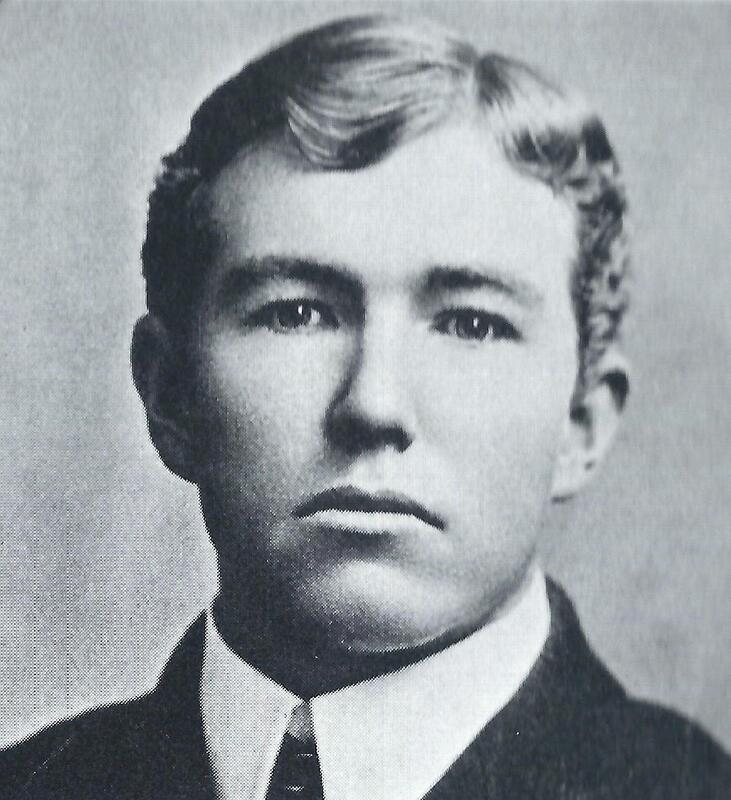 He was “looked upon as one of the most quiet and inoffensive men in the University,” recalled Frank, “and one that the average man would have thought too timid to go off in the dark by himself, much less play a prank causing the hair to stand up on the heads of even some of our most daring students.” Earnest was a musician at heart, somehow acquired a key to the auditorium, and went there late at night to ad lib on the piano. When he discovered others were listening and heard talk about a “ghost,” Earnest entered in to the joke, and deliberately played spooky music. He discovered that if anyone tried to enter the auditorium, he only needed to dive under the chairs near the end of a row, and was almost invisible. At 3 a.m., the B. Hall kangaroo court judged Earnest guilty of insanity, but was too tired to issue a sentence. Everyone went to bed. 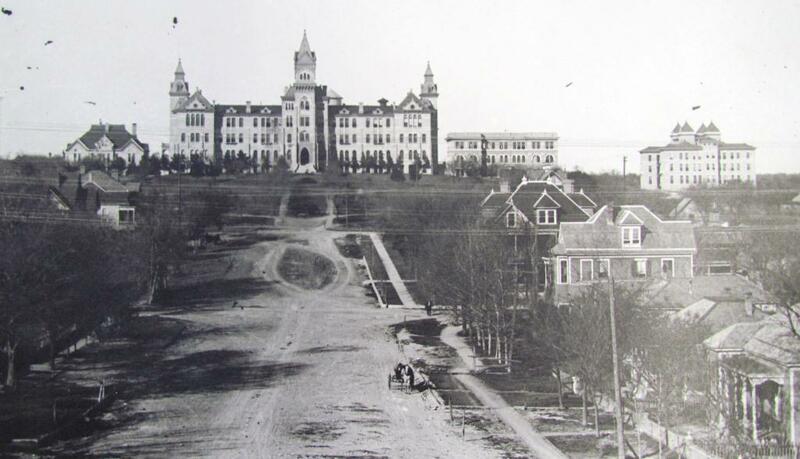 Above: The Forty Acres in the early 1900s. Old Main is at the top of the hill, with B. Hall on the right side of the photo. In between is the Engineering Building, today’s Gebauer Building. 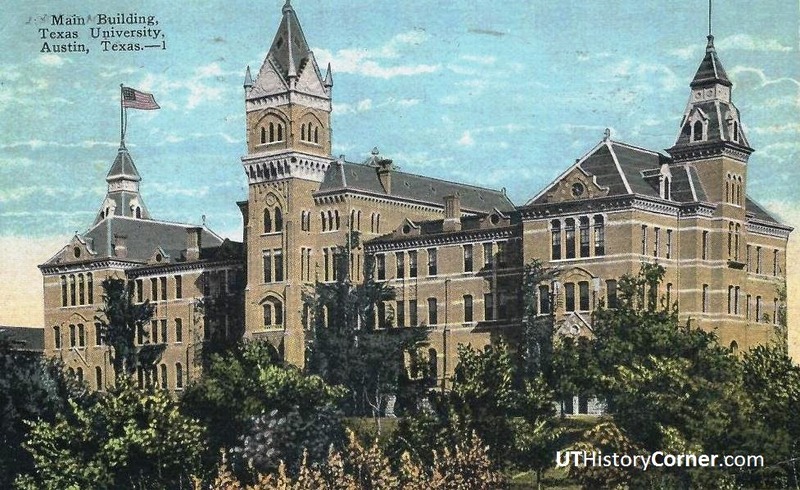 Opened in 1904, it’s the oldest structure on the UT campus, and was under construction when Sinclair and Frank captured the “ghost” of Old Main. This entry was posted in Uncategorized and tagged David Frank, Jim Nicar, John Lang Sinclair, Old Main by jimnicar. Bookmark the permalink.